Christian Hip-hop pioneers Grits have shared the stage with Ice Cube, Outkast, De La Soul and A Tribe Called Quest. Their message of salvation, peace, purity and commitment is delivered over slammin' beats, and power stacked hooks and choruses. Get ready for the awesome singles, `Here We Go' and `Ooh Aah'. 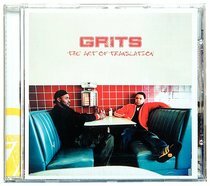 About "The Art of Translation"
:Christian Hip-hop pioneers Grits have shared the stage with Ice Cube, Outkast, De La Soul and A Tribe Called Quest. Their message of salvation, peace, purity and commitment is delivered over slammin' beats, and power stacked hooks and choruses. Get ready for the awesome singles, `Here We Go' and `Ooh Aah'.